Joyce McDonald is multidisciplinary artist, focused in sculpture and painting. Her creativity captures in stark relief the range of emotions she's experienced throughout her spirited life. Her artwork was featured on the front page of the New York Times Weekend Arts Section in July 2016 for Holland Cotter's feature article "Art From the Age of AIDS." Group shows include: AIDS at Home (Art and Everyday Activism) at the Museum of the City of New York, 2017; Everyday at La Mama Galleria, NY, 2016; PERSONS OF INTEREST at the Bureau of General Services–Queer Division, NY, 2016; HIV+WOMEN+ART at Puffin Foundation Gallery, NJ, 2005; Curated at Museum of Contemporary African Diasporan Arts, NY 2004; Visual AIDS: Selections From the Archive Project at Robeson Art Gallery, NJ, 2001; and taken-up at Judson Memorial Church, NY, 1999, among others. 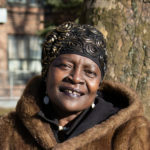 She has been a steadfast supporter and participant in Visual AIDS' LOVE POSITIVE WOMEN and Day With(out) Art programs. Joyce is a weaver of words: not just as a poet or rapper—she is both—but also as a speaker for her church's AIDS ministry and assistant director of its children's choir. She also practices the art of motherhood in her relationship with her two daughters, two sons-in-law and eight grandchildren.